Healthcare architects worldwide have begun to introduce natural materials and forms into their work. One example is Surrey Memorial Hospital, which serves the diverse ethnic communities making up one of Canada’s fastest-growing cities. With an area of 39,250 m2 (420,000 sf), the Critical Care Tower is the largest healthcare project in B.C. history. This expansion to the existing hospital provides the community with world-class family-centred care. The project adds new acute care beds, the largest emergency department in Canada, an adult intensive care unit (ICU), a neonatal centre of excellence, more space for the University of British Columbia (UBC) School of Medicine, and a laboratory with the latest medical technology. The Critical Care Tower was conceived as the new front door to the hospital campus. The massing of the building is strong and simple, combining four durable natural materials—wood, glass, ceramic, and stone. The two-storey base of the tower is clad in a wood composite panel system that embraces the emergency department and neo-natal intensive care unit. The panelling is continued into the interior of the atrium. Rising above the wood base, the six-storey in-patient tower’s façade is glass embossed with a ceramic frit pattern. The glass in-patient tower is connected to the stone-clad circulation tower which is articulated as a separate element. These materials are united in a transparent entry pavilion, the roof of which is supported by two massive glued-laminated timber (glulam) ‘tree’ columns. The warm influence of wood extends from the main entry through the public areas to all the hospital floors, creating a welcoming atmosphere much different from that of a traditional institutional building. 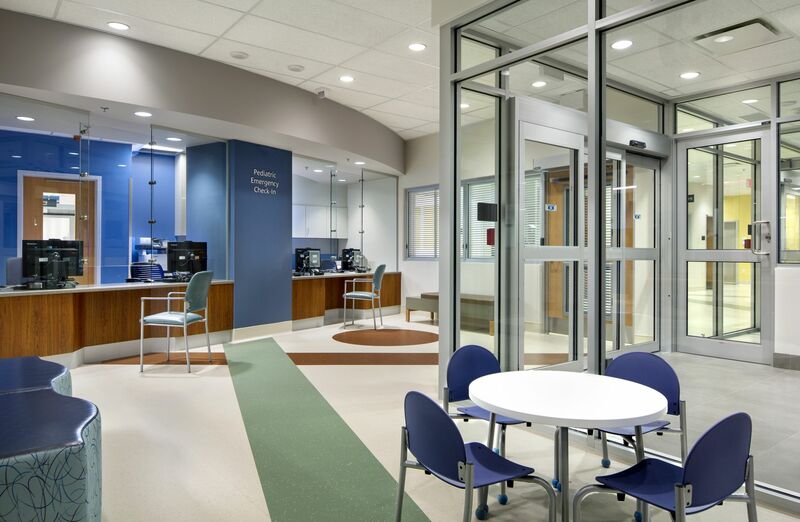 For example, the emergency department is designed in pods—self-sufficient zones that have centralized access to supplies and services. This enables isolation of areas in the event of a communicable disease outbreak or acts of violence. 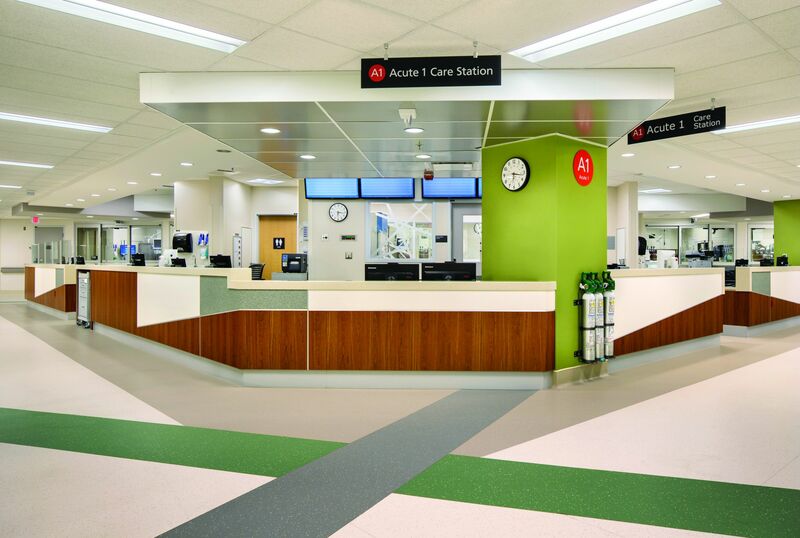 Similarly, in-patient areas provide clearly delineated on-stage and off-stage spaces with patient and visitor areas separated from core staff areas. Universal design (including ‘same-handedness’) supports staff familiarity and efficiency as they move between floors. Lean principles are also applied to reduce walking distances for clinical staff and strategically locate frequently used service rooms. 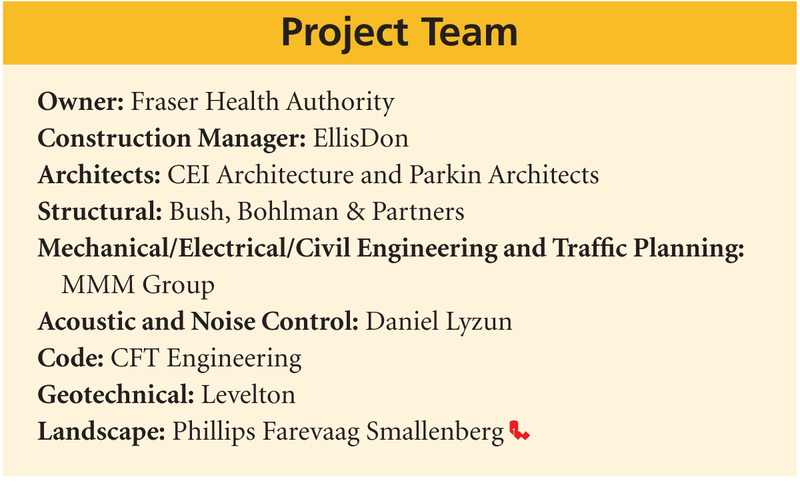 The fast-track, design-build nature of this public-private partnership (P3) project demanded it be conceived and realized through an integrated design process. 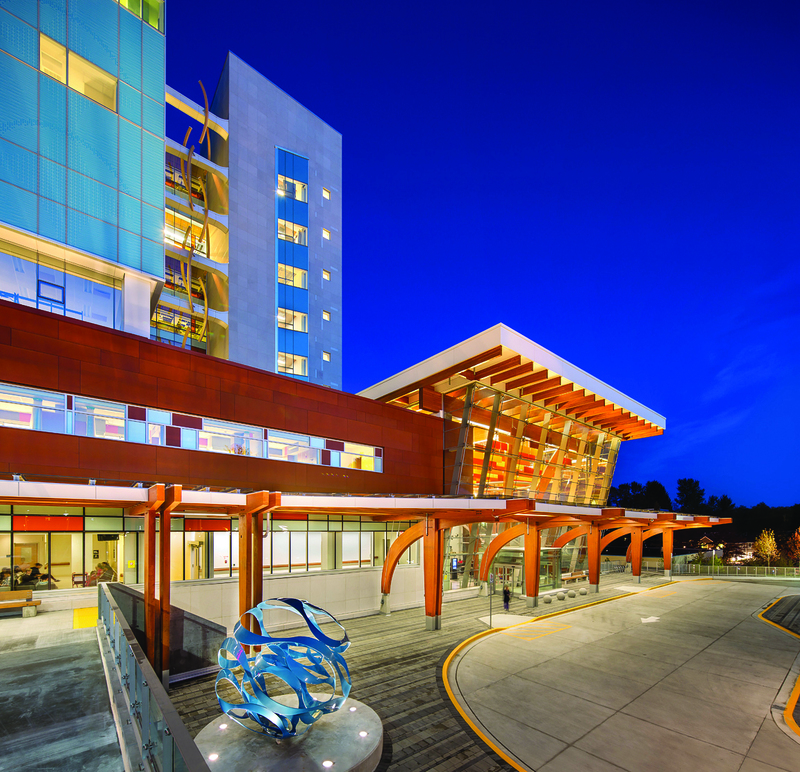 The owner, Fraser Health Authority, required the project achieve Gold under the Canada Green Building Council (CaGBC) Leadership in Energy and Environmental Design (LEED) program—an exacting standard for a building of this scale and complexity. Accordingly, the design team established performance goals within the context of the 30-year operating model used for the project. Design simulations predict a 47 per cent reduction in energy consumption when compared to the reference building under the Model National Energy Code for Buildings (MNECB). The new high-efficiency mechanical systems are integrated with the existing boilers, maximizing energy savings from the outset, while accommodating potential future upgrades or replacement of the existing plant. A flat-plate structure with minimal load-bearing walls and bracing ensures flexibility in the floor plans and supports future renovations and reconfigurations. It also maximizes the use of natural daylighting for energy efficiency and occupant well-being. Materials used in interior spaces contain either reduced levels of volatile organic compounds (VOCs) or no VOCs at all. Approximately 20 per cent of the materials used were extracted and manufactured within an 800-km (500-mi) radius. Wood was specified where possible for both interior and exterior applications—not simply for its physical and psychological benefits, but also because it is a renewable and sustainable regional material. This growing recognition is based on third-party certification of sustainable forest management under one of three programs operating in Canada: Forest Stewardship Council (FSC), Canadian Standards Association (CSA), and Sustainable Forest Initiative (SFI). The country has approximately half of the world’s certified forest area, giving architects and specifiers assurance their use of wood should not be detrimental to the environment. Additionally, wood has a low (and sometimes even negative) carbon footprint because of the carbon dioxide sequestered as trees grow and because of the relatively small amount of energy used in harvesting and processing wood products. The sequesterd carbon remains within the wood throughout its service life as a structural or finish product, and the conversion of trees to durable wood components creates space in the forest for new trees that will continue the carbon sequestration process. Rather than having a detrimental impact on the environment, the by-products of wood processing can be turned into bio-fuel, which provides a carbon neutral energy source. In much of Canada, wood can be considered a local or regional material. The curved pieces in the tower’s center —designed to evoke DNA strands—were constructed from cedar glulam material. The typical connection employs a through-bolted knife plate and a screwed back plate. Epoxy is injected to fi ll the space around the knife plate. It is also worth noting reclamation and recycling of wood can generally be accomplished with little or no reduction in its structural value. Further, as a finish, reclaimed wood is often preferred to new material. Thus, the Wood First Act was introduced primarily for new buildings, but its impacts will likely last beyond the initial service life of first generation structures. 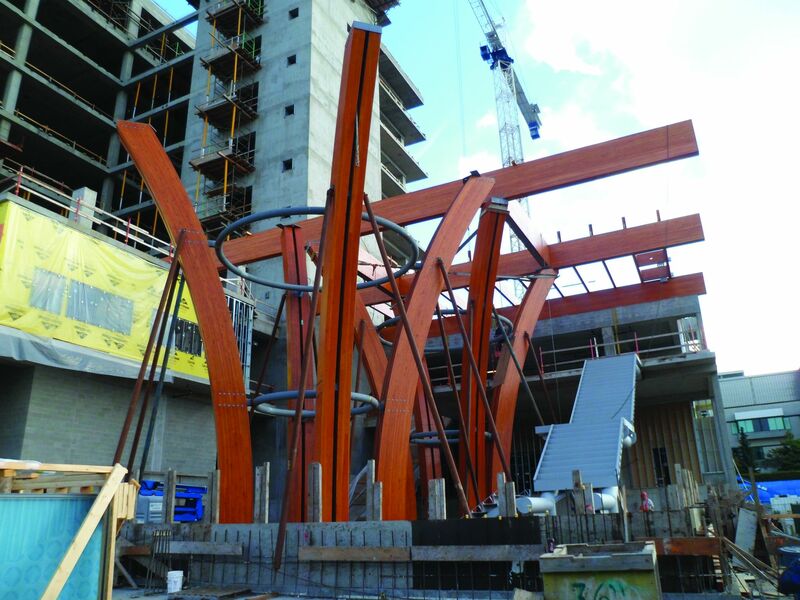 Wood is concentrated in the areas of public interface, including the exterior covered walkways, drop-off area, west entrance, and the link connecting the new tower to the existing hospital. This reinforces the connection to nature, potentially helping reduce patient and visitor stress and anxiety. The lobby, where families and loved ones will spend significant amounts of time, features an exposed wood structure, panelling, and millwork. 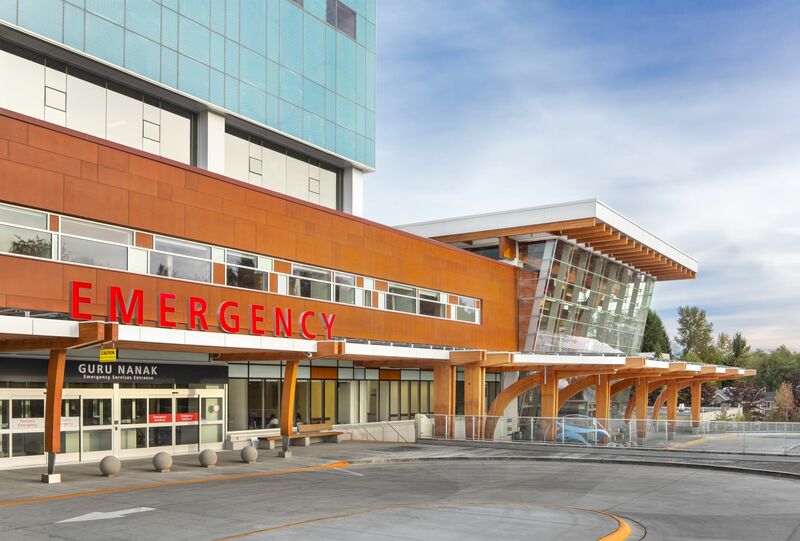 The expansion to Surrey Memorial adds new acute care beds, the largest emergency department in Canada, an adult intensive care unit (ICU), a neonatal centre of excellence, and laboratories. Wood is also incorporated in interior ceiling panels, acoustic wall panels, built-in cabinetry, and the front of reception desks throughout the building, where it can be properly protected (i.e. from physical damage by gurneys, floor polishers and other equipment) and maintained. In some instances, laminate has been used in place of real wood veneer on solid-core wood doors where durability and the integrity of the finish are paramount. 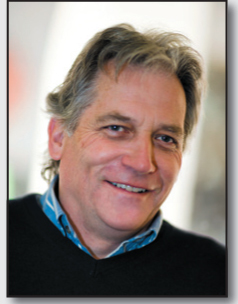 Non-combustible construction is required by the B.C. Building Code (BCBC) for institutional occupancies of this size and height. Thus, the main body of the Critical Care Tower is a 10-storey reinforced concrete frame structure with interstitial service floors. The use of structural wood is predicated on the creation of a fire separation between combustible and non-combustible portions of the building that enables them to be considered as separate structures. structure protected by sprinkler system. Wood is incorporated throughout the project in an attempt to reap the rewards of both its esthetic and functional benefits. With its heavy timber structure, the two-storey lobby sits adjacent to the base of the main tower and is structurally distinct from it. The heavy timber roof structure consists of an upper layer of glulam purlins supported on a lower level of glulam beams. Both layers of this structural lattice cantilever 6 m (20 ft) beyond the line of the exterior curtain wall. The roof deck is profiled metal, exposed on the underside. 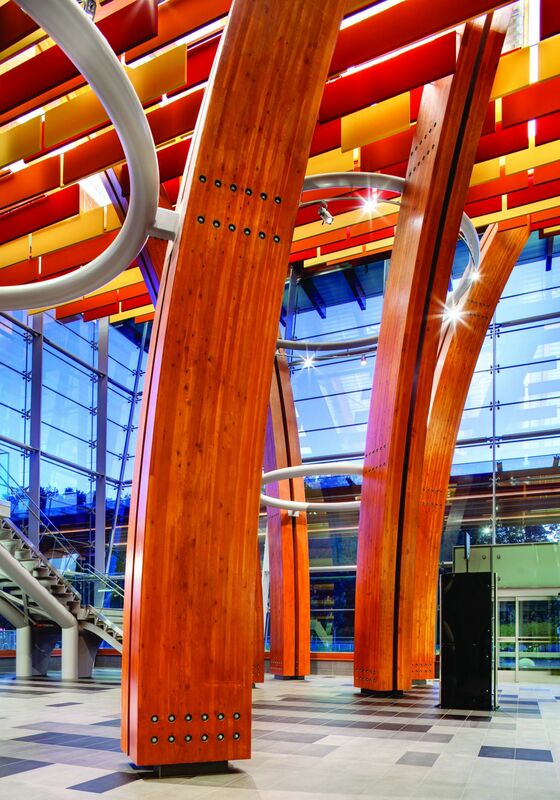 This structural lattice is supported on two massive glulam tree columns, each consisting of four composite glulam and steel curved elements, closely spaced at the base and spreading out like branches as they rise through the lobby. Each element consists of a pair of glulam beams, anchored to a steel base plate, and held apart at intervals throughout their height by 100-mm (4-in.) steel spacers. The curvature of the beams and the cantilevering roof were the determining factors in the sizing of members and the design of connections. The four curved elements are connected at two points by horizontal steel rings and again at the top by diagonal steel tension rods. This arrangement stabilizes the tree structure, resisting the natural tendency of its individual elements to buckle or spread apart. The potential for large deflections to occur in the cantilevered portions of the roof informed the design of the connections between the roof beams and the top of the exterior curtain wall. The weight of the curtain wall is borne by the steel plate mullions, so the roof is required only to resist the lateral loads. A plate connection with a slotted hole was used to ensure no vertical roof loads would be transferred to the steel plate mullions. “With wood structures, it is always the connections that drive the design and often this can lead to interesting and unique solutions,” explained Clint Low, of the structural engineering firm for the project, Bush, Bohlman & Partners. Although the exterior canopy was more straightforward to design, it still posed certain challenges. The roof of the canopy is at a consistent height along the length of the west wall, but the section in front of the atrium is a taller structure, on account of a 1.5-m (5-ft) change in grade. The height and location of the taller canopy added complexity to the lateral design. In the longitudinal direction, it is tied into the upper level canopy where the seismic loads are dragged into the building by drag rods. Since it could not be tied back to the curtain wall, the higher cantilevered canopy is made stable in the other direction through the use of vertical tie rods that connect the beams to concrete pilasters at each bay. Awarded the subcontract for fabrication of the heavy timber elements, StructureCraft Builders took the design by Bush, Bohlman & Partners and made refinements to improve efficiency, economy, and constructability. On the low and high canopies, which included numerous glulam purlins, StructureCraft chose not to install these piece by piece, but rather to prefabricate 2.8-m2 (30-sf) elements onsite, then lift them into place as a single unit. The original design for the curved columns of the canopy included a continuous steel knife plate sandwiched between paired glulam elements. To simplify fabrication and reduce the overall cost, StructureCraft suggested increasing the size of the glulam elements and eliminating the knife plate, while maintaining the required shadow gap using plywood spacers. Similarly, a steel hollow structural section (HSS) spacer between the vertical glulam elements was eliminated by redesigning the column to beam connections as a moment frame. For the large tree columns, the primary concern was constructability. Although the four-column tree configuration, tied together by steel rings and connected to the glulam lattice roof, was designed to be stable in its final configuration, finding a way to erect it safely piece by piece was a considerable challenge. The chosen solution was to use adjustable tilt-up shoring to stabilize each prefabricated paired column unit as it was manoeuvered into place. Secured to its base plate, and with shores essentially creating a temporary tripod structure, it was possible to erect all four columns independently and then to install the ring connectors. 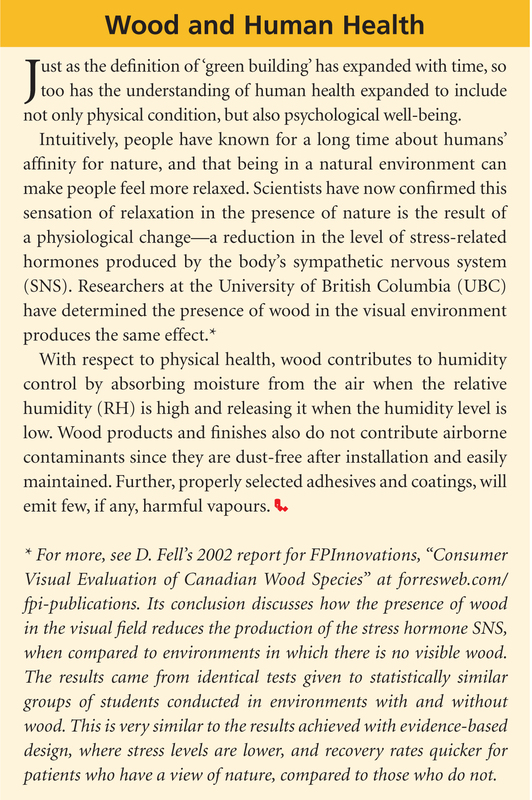 This project provides further evidence Canada’s healthcare sector now recognizes the important role that can be played by wood in the creation of healing environments. Beyond the environmental advantages it offers, the physical and psychological benefits of wood make it a desirable choice not only in healthcare facilities, but also in buildings of all sizes and types. As a new generation of architects and engineers rediscover the potential of the material, one can expect wood to play an ever more prominent role in the country’s public buildings.